(The Star) – The exclusion of Prime Minister-in-waiting Datuk Seri Anwar Ibrahim from the Economic Action Council (EAC) was decided by the Prime Minister, says Datuk Seri Azmin Ali (pic). The Economic Affairs Minister assured that the council will, however, involve all stakeholders in the engagement process in order to draw up the best solution for the country’s economic challenges. “This was a decision by the PM (Tun Dr Mahathir Mohamad). “But I’m confident that in the process of engagement to obtain input and feedback, we will engage with many stakeholders including the youth and the business communities. We need all input,” he said when asked to comment why Anwar, who was also a former Finance Minister, was not in the council. Azmin said this after a Chinese New Year event with the Federation of Hokkien Associations of Malaysia at a hotel here on Tuesday (Feb 12). He also believed that the EAC is well represented by credible personalities who are experts in their field. “They have wide experience in many areas and they will continue to engage with stakeholders so we can formulate and draw up immediate and long-term strategies to resolve some of the compelling issues,” he said. 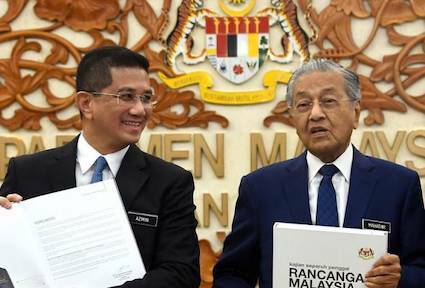 Azmin added that Dr Mahathir had asked for the council to hold its first meeting as soon as possible.